I wish I were in Jason Robillard's position -- getting to see first hand, touch and pick up, maybe even test, the new offerings of coming shoes before they hit the market. 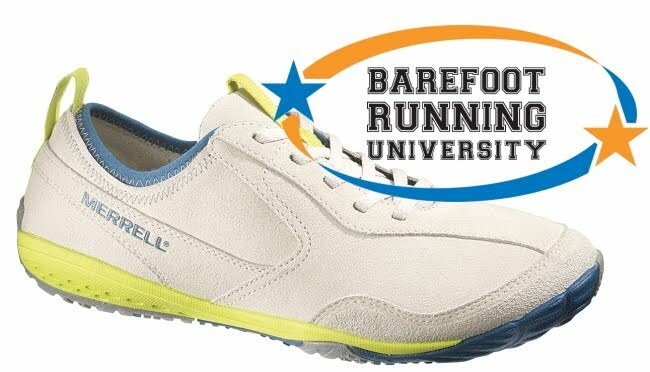 He spilled the beans on Merrell's 2012 line-up in his post for today. And I've got to say... It looks beyond promising. And there hasn't been a hint of the coming line on Merrell's website. 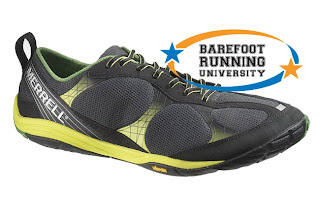 Was Merrell listening when I wrote my piece on what I'd like to see changed in the Trail Glove? 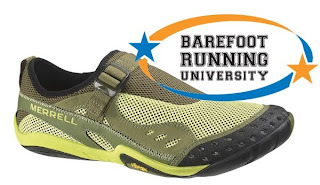 It would seem so, not so much that they've changed the Trail Glove, but they've introduced new models for next year that have addressed every issue I have with these great shoes. First up is the Road Glove, which looks to have done away with the massive undercut at the 5th metatarsal, and filled in the area under the lateral arch. Goodness. Next is the Edge Glove, which shares the above features with the Road Glove, but is a casual-oriented shoe (and would become my every-day shoe if it is available in black). And the Rapid Glove looks like Merrell's answer to the Vibram Five Fingers, just without the individual toe pockets. Made as a water-sports shoe, this may become a favorite among those running in wet climates (uh... Seattle?). Shoe lust all over again. I've had my smart phone for a couple weeks now, and I've been having a lot of fun with some of the free games. One of the more simple, but addicting ones is Mr. Weiner, a game where you move different shaped objects around (latte cups, milk cartons, hamburgers, and corn on the cob) out of the way so that Mr Weiner (a hot dog) can move off the board. One of the things I've found is that most often, when Mr. Weiner isn't at the left-most column (he exits to the right), usually you have to get him there before he can move right. He has to move backwards first in order to move forward. I made a comment a few weeks ago, when I first got back to running after the calf strain, that I was going to ditch the Tacoma Narrows Half Marathon because I didn't want to push myself too hard and re-injure myself. Well, one week ago tomorrow, I did JUST what I said I wouldn't do -- I went out to test myself over 7 miles, and paid for it. My calf didn't give me the stabbing pains as it does on initial injury, it just got progressively tighter and more painful, and no amount of stretching or massage would get it to relax. And in the aquathon on Wednesday, I had a minor tweak, and was able to keep my form together enough to finish the 5K, but my calf locked up after the run, and it wasn't until well into Thursday that I could even walk somewhat normally. So I'm having to take a step or two back with the running, time off (though I'm still biking and swimming), to let it heal. Maybe I'll do the aquathon in two weeks as my first run. And that may be the only running I do for a while. Because I do want to move forward. I haven't given up on the idea of the half marathon, I've just realized it isn't going to happen this year. Likewise, in a more global sense, there's a need to take a step or two backwards in order to move forward. Jason Robillard, in his post from today, talked of keeping the message of natural, bareform running as simple as possible. Taking a step back from advanced ideas. And I dare say that the "analysis paralysis" that seems to be taking the expert field by storm, fueling the arguments for and against, are heading down a bad pathway. Footstrike, impact force transients, feel vs float... I just know that I'm more comfortable running as I do. And I am getting more and more amused all the time as the shoes I prefer to run in seem to resemble, more and more, those that were available when I first started running distances, back in the late 70's. I took my old Nikes to the belt sander today in a second stage of modification, making them more... simple. More like two steps back in order to enable a thousand forward. Maybe I should stop signing up for races... Though it's only two data points, I'm noting a disturbing trend in my legs related to signing up for events -- I tend to get hurt the day after I sign up. Okay, really with this go-round, I'm not totally sure what's going on. I mean, I know it's the soleus muscle, the same one I strained a few weeks ago... And I know I probably shouldn't have done over 7 miles on it yesterday morning... I managed to get through that by going really slow and altering my gait to try to keep from stretching it. It's more than just "sore" from workouts. That kind of pain goes away with a warm-up. I stopped to stretch and massage it, and it just kept getting tighter and more painful. And during the Warrior Dash, it felt fine. But I was also running very slowly, and walking a lot (much of it wasn't "runable"). So that whole "run every day" thing I was thinking of... Well, I made it a week. Woohoo! My wife told me that the RD for the aquathon series may be canceling the first event. That could be a good thing for me. It's in two days. I might be able to do it anyway, if I can get the muscle relaxed and stretched out (and run with that altered gait). We'll see. And Eric seems to have the same kind of thing happening. He was supposed to do an Oly tri on Saturday. On Thursday, he twisted his ankle on a run, and a doc visit said he'd torn some ligaments and chipped a bone. He says he's going to have to be "down for the count for a couple weeks". The run today was one of incongruities. I wrote earlier that I'm exhausted from the weekend -- two races timed/volunteered, both some distance away. Lots of time on my feet, and toting equipment around. Bad sleep, from having AC units kicking on next to an unfamiliar bed, to just plain short nights. My original plan was to run 6 miles at lunchtime, but not press the pace. I figured that my legs were somewhat rested from no running all weekend, and keeping the pace reasonable would be prudent given how tired I felt. So I started off easy into the partly cloudy and 65 degree mid-day. I really didn't feel like I had any snap, but my form felt pretty good. I just cruised along, and re-evaluated at just over 3 miles whether I'd continue. I pushed on, wanting the 6. I could feel it warming up, knew I was pretty dehydrated (the race mornings don't lend themselves well to keeping up on water intake), and just eased up at about 5 miles. Having to concentrate on keeping the calves relaxed, I backed off even more. I just didn't feel strong, but my form was still holding well. On the last hill, at 40 minutes, I mentally gave in and stopped to walk a bit. I turned around, making sure I didn't walk any distance forward on my course. Got back to the same point, restarted the watch, and pushed the rest of the way in... stopping the watch at 48:01. For 6.02 miles. Just under 8m/m pace. So now I know why I wasn't feeling strong -- my pace was "high" for the distance, and I didn't feel like I was pushing the pace at all, but I really was. Incongruity. When the run is "fast", even when it doesn't feel like it. I remember an old Star Trek: The Next Generation episode where there was this race of... whatever they were, and they would scavenge things needed to keep their ship in repair... "We collect things. Things that make us go." Well, they stole some weapons... "Now we're strong." Then they kidnapped Giordi LaForge... "Now we're strong AND smart." So... My wife wanted an iPhone 4 for her birthday. She's with Verizon, and has been for some time. I've been with Nextel, then Sprint, for some time as well. But we figured out that we could get smartphones with data plans for the same total that we're paying together now. Both our plans were coming up for renewal this month. Verizon kind of forced our hand a little early by announcing they were doing away with their unlimited data plans as of... yesterday. We (okay, SHE) hurriedly made all the needed calls, got my company discount applied, and ordered the phones (I got the Droid Global 2). They should arrive today. I know I want to use the phone for navigation (I'm HORRIBLE with directions), and would like to use it for route tracking when running and riding. I can't use WiFi at work. All this added up to needing the unlimited data. But I have no idea what I'd want to use for tracking and such. Which apps? So... Calling on the users of such devices, what say you for the usage of these devices for running and riding, and the apps you use for tracking? Drop me a comment. On a ride with my friend Eric yesterday (while he put the screws to me -- my biking endurance not what it should be), he mentioned how he had gone to the YMCA to swim that morning, and how the pool was almost empty, except for the old people. So this was the morning of July 4th, the previous evening having sounded like I was in a war zone for all the booms and screams of fireworks well into the night. WELL into the night. Much like the community party that we'd witnessed on Saturday in Sunland Estates, people were beyond willing to celebrate all weekend. Meaning the roads were pretty empty (in fact they were very empty well into the evening). Hard to get up early on the-morning-after-the-night-before. So who gets up early? Yup... Triathletes and old people. People for whom it's more difficult to change the sleep schedule, or maybe just unwilling. Priorities and all that. Those who want to get the training in before family time, and those who were raised on Ben Franklin's "early to bed and early to rise" mantra.